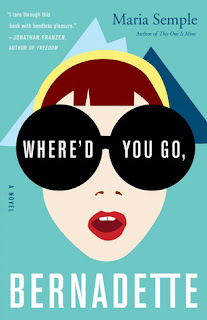 I've heard about Where'd You Go Bernadette by Maria Semple, as you do when you visit blogs and see what readers are reading. I thought it sounded good and maybe one day I'd read it. 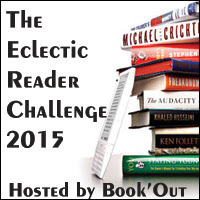 The time for that came when I was looking for a piece of epistolary fiction to move me further along to fulfilling The Eclectic Reader Challenge 2015. The story is told through notes, emails, faxes, letters mostly. In between there is a commentary kind of style told by Bee the daughter of Bernadette and Elgie. It is cleverly done and I enjoyed it very much. It was full of humour, at times there would be a narrow focus on something and then the lens would move out until the full happening was revealed. Bernadette is off side with the gnats as she calls them, parents at her daughters school. I loved this first section of the book when she was at war with them. Is Bernadette a weirdo or a genius? Is she depressed and suicidal or quite sane. And where does she go when one day she disappears - like a Houdini. It was really interesting watching all that play out. There were characters in this book I didn't like so much but one thing I learned from it was that a quick judgement about one of them was not going to work. I had to wait until the whole story played out. I liked the mother/daughter relationship, and while Elgie (husband) was at times frustrating, ultimately he came through. 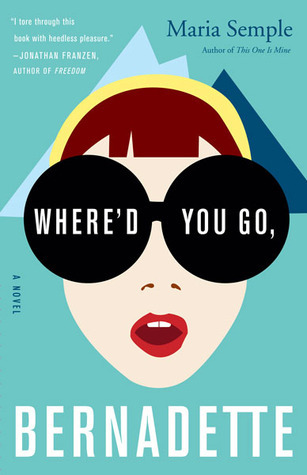 Extremely clever and entertaining novel. Ooh so glad you loved it, it's been waiting patiently on my kindle for a while so I might push it up the list. I really need to read something with humour. Love that photography analogy btw. Thanks Sheree. It was the only way I could think to describe how she does some of the humour. I was really slow to read this one, but it was a goody. It's definitely clever! I had a lot of fun reading that one. Yes, I was slow to the party, but loved it when I got there! Am in the minority here! didn't like it very much. Sorry to hear that, but not every book suits everyone, I think the whole catty parent thing drew me in. I had misgivings about this book when i first heard about it, but you've sold me on it so now it's added to my Kindle TBR. Thanks for making me rethink about this book. This book has been sitting far too long on my stacks. I just may have to rescue it and hopefully get to it before the years end. It's been a long time since I read this one, but I also enjoyed it and liked the creative style of it, once I got used to it. I have this in my TBR, just haven't found my way down to it yet. Now I want to pull it out and move it to the top. Great review Kathryn! This was a very clever story. I really liked this one a lot. I thought it was incredibly clever. I still have her previous book on my shelf to get to too. So glad you enjoyed this! I did, too. Having had kids that age in school not too long ago, I found the school scenes and Bernadette's battles with the other parents just hilarious! It was very true to life. So true Sue, as a teacher I got that so much and loved it too. I have seen this one around and have been tempted, you have certainly made it sound good! Thanks for sharing! !